Providing you the best range of sigma mixer with extruder screw, sigma mixer extruder and lab model sigma mixer with effective & timely delivery. 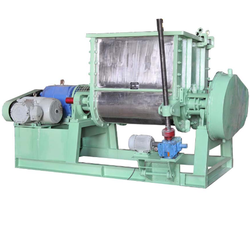 The Sigma Mixer with extruder is used for mixing, kneading and extruding of highly viscous mass, sticky and dough like products, Mixing of pastes, rubber, and heavy plastic masses, applications in Food, Rubber, Pharmaceutical, Chemical and agro industries, Dry powder to wet phase mixing. The extruder mixer is designed to handle difficult to discharge products such as hot melts and butyl sealants, as well as other medium to high viscosity pastes. This type of mixer combines the action of the Double Arm Sigma Blade Mixer with an extrusion screw placed in the lower part of the mix trough. During mixing, the extrusion screw is run in reverse which imparts a third mixing action on the product, increasing mixing efficiency. The extrusion screw is located in the saddle section and runs in a cylindrical trough tangential to and below the 2 mixing blades. When the product has finished the mixing cycle, discharge/extrusion is performed simply by running the extrusion screw in a forward direction. Product Bowl with Jacketing for heating and cooling. 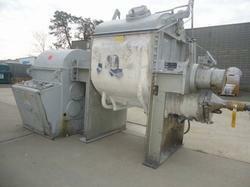 Enclosed mixing and discharge provides protection from product contamination and greater operator safety. The clearances between the walls and the container are kept to a minimum to ensure maximum efficiency in kneading and mixing. The shafts of the sigma blades are fitted in bearing blocks which are each provided with roller bearings, steel glands/teflon rubber seals for smooth and leakless operations. The kneader is mounted on a sturdy base frame fabricated out of ISMC sections and are free from vibrations. For cooling and heating jackets are provided. thorough & uniform mixing at close or specified clearance with the container. manually either by system of gears manually operated or motorised.